Dean and Deluca's Flagship store is in the trendy SoHo neighborhood of NYC. It was such a treat for us to go and visit (and drool) in this stylish market. Many international items; grains, crackers, syrups, breads - oh the breads. This is just a small sampling of their cheese department. It was difficult to choose. But after sample a couple of cheeses a few in our group picked a sharp Roquefort and a milder blue cheese. I spent my limited time deliberating over which chocolates to take home with us. Later we cut these beautiful pieces up and shared among the adults (the under 20 crowd was happy with M&M's they didn't have to share!). The flavors included Lavender (purple), Rosemary (green), Passion Fruit (orange dome), Port Wine Fig (Purplish white), Winter Spice (tall orange), Rosewater (heart), Vanilla spice (white) and Grapefruit. Some other Dean and Deluca purchases included Elder Flower Syrup from Austria and Crimson Lentils. At first glance this might look like a display window for upscale designer purses and bags, but all of these hand bags are cakes! Gracing the window of the International Culinary Center, it was fun to stumble across this window display featuring purse cakes crafted by New York students of Cake Techniques. They are for display only so we did not sample any of these beauties, but aren't they clever! crafting his own design - tic-tac-toe - several games... orange won one game, and green won the other game. Start to finish, from separating eggs to mixing to baking to licking beaters to coloring icing to designing to decorating... he was hands on... it was a perfect snow day activity! This is what pleased as punch ten looks like. An excursion into The City included a morning at The Metropolitan Museum of Art at 1000 5th Avenue. This amazing museum houses a wide variety of exhibits and collections. We happened upon the exhibition British Silver, the wealth of a nation which featured 80 objects from the mid-sixteenth thru the mid-eighteenth centuries. On exhibition since May of 2012, the Sunday we were there was its final day on display. This gorgeous rococo style tea kettle with spirit lamp and stand were crafted by London silversmith Paul de Lamerie and owned by prosperous merchant David Franks of Philadelphia, most likely in celebration of his marriage. This elegantly elaborate dish would certainly make a statement at any special event. This lovely assortment of silver spoons was also on display. Notice the sugar tongs in the top of the picture, and the strainer spoon below it, used to remove any stray tea leaves that might be in the tea pot. These darling miniature pieces on display captured my eye. How I would love to have a piece or two in my collection! We choose the Met, where the Arms and Armor section kept the young ones happy, and I was thrilled to find myself in a Garden. This is the entrance to the Chinese Tea Garden. The round door and the rectangular door along the slate walk entering a garden path represent the balance of Yin/Yang. This peaceful Asian Garden Court brings the outdoors inside. The windows in this wall are all different designs so that the person living here would never be bored. Water is always an important element in Asian gardens both to be seen and to be heard. This is such a lovely way to spend a winter day. 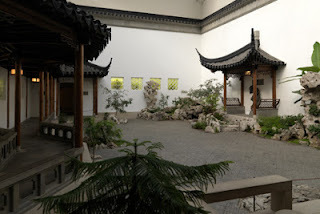 The above photo is from the Metropolitan Museum of Art Website, it shows the design best with the covered walkway representing the house and the delightful courtyard. 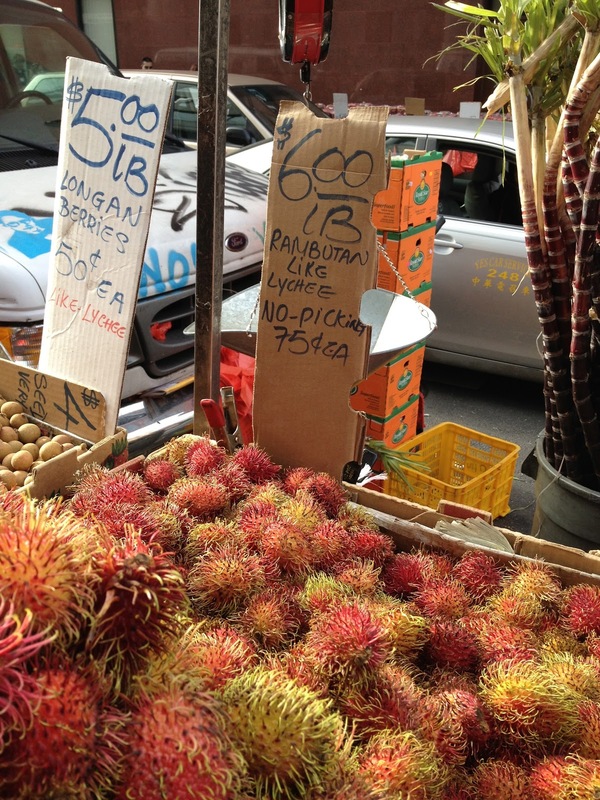 During our free time in Chinatown, we poked our heads in a number of herb shops. Fun to see and smell but also overwhelming at times since we can't read Chinese. The one above is the shop of an Acupuncturist. Very pretty place the drawers on the left all contain loose herbs which they will measure out for you. The boxes on the right are patent medicines herbal, mineral, animal and I am not sure what else really. This sleek shop above sold fragrant herbal soaps, shampoos, and eye shadows, nail products - all beauty oriented. We stopped at another herb shop full of shelves stocked with herbs in glass jars (reminiscent of The Rosemary House) where we found these Indian long pepper corns (Piper longum). They taste a bit hotter then their cousin black pepper (Piper nigrum) and you can use them in your pepper grinder. She also had smoked peppercorns which had a wood fire smoke fragrance to them. One of my goals was to restock my supply of Moxa Sticks. Moxibustion is a traditional Chinese style of healing by warming the acupuncture points or by warming areas in your body where you may be stiff or sore. You light the end of the stick and smudge over your victim patient until there is a large red area and the patient says it is getting very warm. The moxa stick which is made of the herb mugwort (Artemisia vulgaris) works by stimulating circulation of the blood flow and the qi. Many mid wives will use a moxa stick to help to turn a baby who is not positioned head down in the last weeks of the pregnancy. Chinatown is just one of the many little neighborhoods that makes up NYC. It offers a variety of unique experiences. 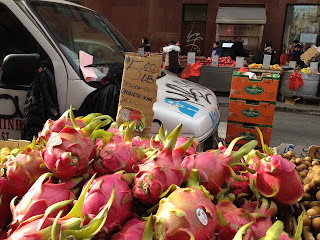 There were many, many open air produce markets all along the sidewalks and they were all quite busy. While we know what pineapple is we had never seen it peeled in such a decorative way. 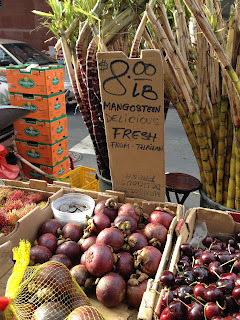 Mangosteen had a segmented white fleshy sweet inside. This is Dragonfruit which is a strikingly beautiful color but we found it to have a moist but disappointingly bland flavor, full of tiny seeds similar to a kiwi. Rambutan, above, is a lychee-like fruit. After peeling and finding the seed there was a moist sweet "eye ball" like fruit inside. The group ate quite a few of these. Sugar Cane was readily available and they would use the cleaver to cut it down for you. Cedar was struck by the meat markets and the King Crabs, the Alligator arms, the live frogs and other unidentifiable meats. The small town kids had large eyes from the sights, not to mention the smells and the sounds. Although hesitant to have lunch in Chinatown, served family style on a large lazy Susan, they later admitted it was really good. Phil, our NYC leader affectionately refers to the hot dogs we can buy on every corner in the city as "Dirty Water Dogs". Not a very appetizing name for an American Favorite! He goes on to explain that the food trucks are inspected and graded and licensed as the restaurants and are perfectly acceptable to buy from. They are certainly the bargain of the city, both for a quick drink and a quick bite to eat. We were struck by how they foods in these carts has evolved beyond hot dogs and pretzels. Falafel and Gyros are always favorites. But there are a variety of waffles and crepes to be found. It is difficult to walk by the Cupcake Lovers truck! They all look so pretty and tasty! As a matter of fact, we didn't make it past the cupcake lovers truck... the youngest delighted in being able to each select a cupcake... small, medium, or large... we opted for the medium cupcake at $2.50 each instead of the large priced at $4.50. Ice cream is a classic... more popular in the summer months than in the dead of winter, I'm sure. But I had to stop for the classic New York street food. Steamed chestnuts! Only available in the winter months these are served in a brown paper sack, are easy to peel and offer steamed, nutty flavor. Here's a glimpse at our sister's collection of blue and white china, tucked here and there on the shelves. A willow ware tea cup and saucer, originally from our mother's collection. Souvenirs from travel long ago, this little ginger jar is from Fortnum & Mason in England. Love this little basket with the blue and white ornaments nestled among the antique tin cookie cutters. Something homespun and cozy about it. And, blue and white saucer and plates, long-ago souvenirs from New York City. Thank you, Sister, for letting us share some of your collections and treasures. We enjoyed a long weekend getaway that included a journey to New York where 11 of us were welcomed into the home of the eldest Reppert daughter (#1 of 4). Just for reference, #3 and #4 are the authors of this blog. While admiring the assorted treasures tucked around the house, the tea collection kept jumping out at me, so I took a few pictures to share some of our sisters collection. These cute little teacup bird feeders were a Christmas gift to each of us, crafted by her daughter and two precious granddaughters, repurposing chipped, cracked, or handleless teacups. Such fun! They are indoor garden art at the moment. This sweet little teapot is a souvenir from a vacation trip to England many years ago. A charming little Sadler teapot, it features many of the popular visitor stops when traveling to London. Tucked on another shelf is this pretty lemon pitcher. It reminds me of some of the pitchers we used to sell in The Rosemary House in the early years. Cheerful and colorful, it adds a touch of whimsy to the shelves. And this miniature Portmeirion teapot from the Botanic Garden collection is tucked on a shelf in the kitchen. Daughter #1 recently retired after teaching earth science and/or biology for 30 years. Her home has a natural feel to it, with many things representing nature tucked here and there. A preferred coffee drinker, her collection of tea themed treasures hints that she has a hidden passion for tea!